The Linksys Wireless-N Range Extender lets you repeat the wireless signal of any access point or router to provide Internet connectivity in hard to reach areas through a wired or wireless connection. This article will guide you on how to manually configure your wireless range extender. To learn how to check or change your wireless network’s settings using the Linksys cloud account, click here. If your router has the classic web-based setup page, click here. 2. Reset the range extender - Press and hold the Reset button located at the top panel of the range extender for five (5) seconds or until the LED starts blinking to restore to its factory default settings. Connect your computer to the Ethernet port of your range extender using an Ethernet cable. NOTE: Images may vary depending on the type of computer or range extender you are using. In this example, an RE2000 is used. Plug your range extender to the power outlet. Make sure the LED lights are stable. Launch a web browser and enter your router's IP Address or "192.168.1.1" in the Address bar. To learn how to check the IP Address of your Linksys router, click here. NOTE: If your computer has defined a default startup web page on your browser, the dialog box asking for a username and password will automatically appear. You will be prompted with a window asking for a username and password. 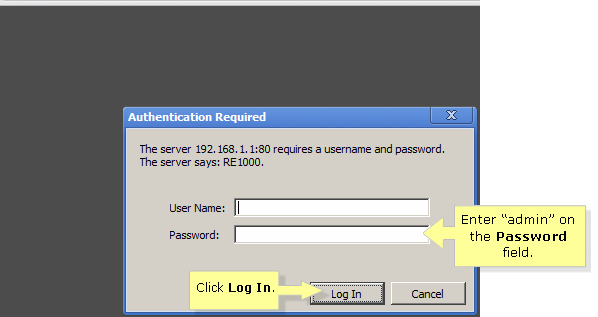 Leave the User Name blank and enter “admin” in the Password field and then, click Log In. Click Wireless > Basic Wireless Settings. Set the radio button to Manual then enter your router’s Network Name (SSID). On the Wireless Security section, select the security settings that match your router’s configuration. Enter your Passphrase or WEP Key then click Save Settings. QUICK TIP: For optimum Wireless-N performance, it is recommended to use WPA/WPA2 wireless security on your router and range extender. Unplug the power cables of the router and the range extender for 30 seconds. Plug in the router first. Wait for all the lights to be stable then plug in the range extender. Your range extender should now be in synchronized with your router. QUICK TIP: In order to make sure that your extender is successfully installed, access your router’s DHCP table and check if the range extender is listed there with its IP Address. Ping the extender using a wireless computer and check if you can get replies from it. To learn how to check devices connected to your router through the DHCP table, click here. For instructions on how to perform a ping test on your Linksys device, click here. Aside from the range extenders, there are also other devices available in the market today that can help you extend your local network either wired or wirelessly such as switches, access points, wireless bridges and etc. You can choose which of these products exactly fit your need. Click here to know more about them.